It’s so difficult to keep track of how much you spend monthly on things that just fly out of your account. Whether it’s your iCloud subscription, Spotify or Netflix. We all have an extra few pounds to spend on bits and pieces, that aren’t easy to track. Or, at least until Bobby came along. The app is an easiest way to get insights in your fixed costs, making it easy to manage your subscriptions and get notified when a bill is due. The app is beautifully designed, and you can add ‘subscriptions’ which are things which come out either monthly, quarterly or yearly. Pick from a selection of colours, and icons… plus many pre-defined icons including brand logos tying the whole thing together. 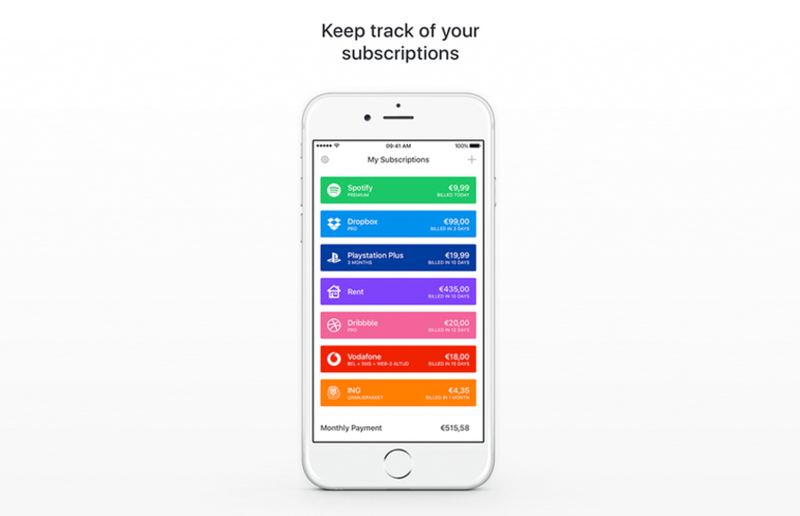 Bobby also provides a clear overview of all your subscriptions and upcoming bills. This way you’ll always know the amount of money spent on subscriptions, which helps you to control your monthly spendings. Check the app as little or as much as you like throughout the month to make sure you’ve got enough in your account to afford that next round of drinks, or fancy trip away. It can also help you spend better, notifying you when a bill is due, so you’ll never have to deal with late payment fees you didn’t know about again. It also will, by doing this, prevent you from having insufficient funds in your account on the day a payment is due. Helpful eh? Bobby is available on the Apple App Store now for free, with an upgrade to unlock more subscriptions for £0.79.